A native Bostonian whose royal position requires him to do the work of the Crown. You believe that the British Parliament has a right to impose laws on the colonies whether or not you personally like them. Your support of the Royal Government earns you the position of Royal Governor at a politically charged time. Your political opinions make you very unpopular and a mob ransacks your home. Though you love your hometown of Boston, you are forced to leave. You end your life and career in England as an advisor to King George III. You encourage him to treat the colonies kindly. 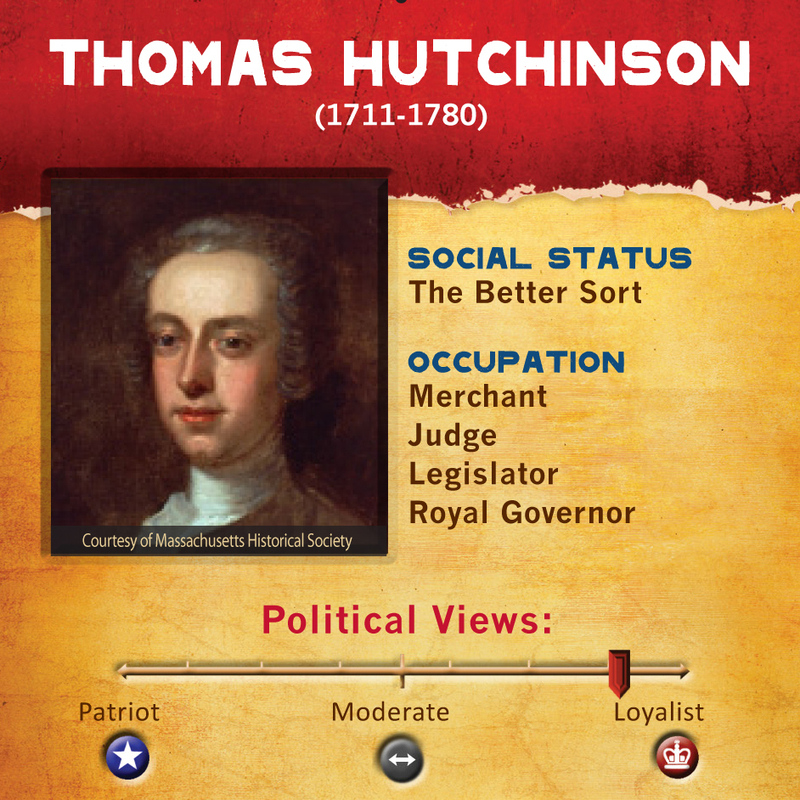 Thomas Hutchinson was a loyal British subject but also a true admirer of his own colony’s history and culture. He was a level-headed and reasonable man who succeeded in business and politics. He never intended to take an extremist stance, but his position in the colonial government made him the face of hated policies and transformed him to the most bitterly despised man in America. Thomas Hutchinson from Mass.gov- This short biography is a general summary of Thomas Hutchinson’s life and political career. The Ordeal of Thomas Hutchinson- This book provides a sympathetic view of Thomas Hutchinson’s political life. The History of the Province of Massachusetts Bay from 1749 - 1774 by Thomas Hutchinson- Thomas Hutchinson wrote his own account of the events that lead to the American Revolution. Instead of the angry, account you would expect, he remains cool and detatched- even boring as he describes the events that lead to his ruin.